In our teeny-tiny fabric shop, Purl Patchwork, it is a challenge to find fresh ideas to display our favorite products in customer-friendly ways. We were really scratching our heads when a bunch of new Tana Lawn prints from Liberty of London arrived last week on unruly five-foot-tall bolts! Our solution: we filled a handful of simple wooden embroidery hoops with swatches of fabric and displayed them all on the wall like a family portrait gallery. These swatch portraits are so easy to make and they make great gifts too! Enjoy! A square of fabric, at least 2″ wider than your hoop in all directions. We used Fabrics from our collection of Liberty of London, Tana Lawn. Place fabric in the hoop, pull taut. 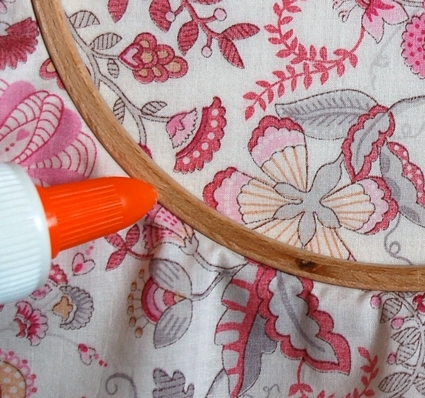 Turn to wrong side, run a small line of glue around the inside hoop, just next to the fabric. Press fabric into glue, all the way around. 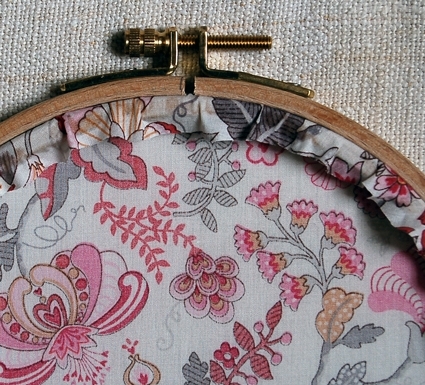 Trim fabric to edge of hoop. What a nice idea! 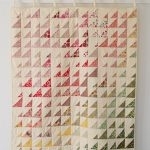 Instead of hanging fabrics on a line or tacking them up I think I will try this. I quite enjoy visiting this site. Thank you for the inspiration! This is the cutest idea ever. I posted a link to your site on mine so others can see it too. what a brilliant idea – and what a gorgeous display of wonderful fabric. I’ve recently made a blouse from the fabric in the very bottom lefthand corner. What a fantastic idea! It looks fabulous. GREAT idea! Something to try in my sewing room! I love it! This is a super idea! It looks fantastic and serves as a wonderful display to showcase the fabrics. I love this idea!! I see embroidery hoops all the time when I’m thrifting, now I have a reason to buy some! This is so pretty – simple and adorable! Thanks! That is such a fantastic idea! Could I perhaps use one of your pictures to profile said idea in my own blog? I won’t have the funds to try it myself for a while, and I’d like to include it in a post I’m writing up of crafters/artisans/ideas I admire. What a great idea! It makes a change from the photo frame displays- in fact it has given me a great idea to actually use the hoops as photo frames – Can’t wait to try it now! i really really love this idea. another thing you could do is paint the hoops different coordinating colors. also – could you use double-sided tape instead of glue incase you wanted to swap out the fabric for different seasons or looks? 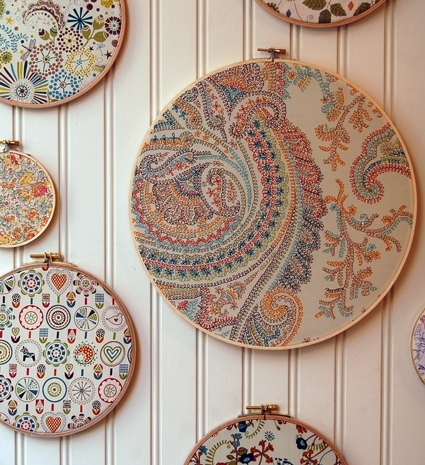 Love the embroidery hoop idea, I know what I’m going to do with my favourite fabrics. i love the idea, too! Brilliant idea and wounderful fabric! What a stunning image! You do great things with fabric, ladies! I do a similar display with my knitted swatches using small 5×5 shadow box frames. Might as well use them rather than just have them lying around! What a wonderful display of fabrics! I have some that I will share in your new group!!! love your blog–keep up the great work! 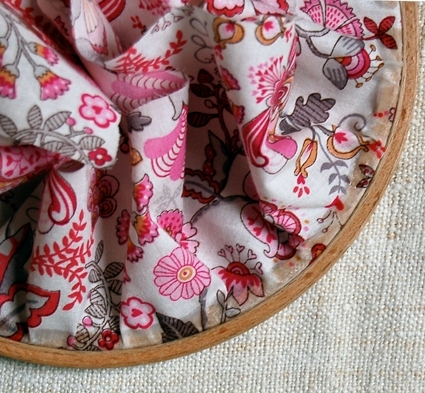 I love the bird and cherry blossom fabrics…such a sweet, simple idea that looks gorgeous. Well done Purl! I saw this linked over at Decor8 and love it–it’s perfect for those of us *compelled* to buy pretty fabrics but not enough projects to use them up! Thanks for the idea! I discovered your blog on the Adorn blog site when they posted a link to this. What a lovely idea….so cut !!! i love this idea…i want to use it in my bedroom. As usual, you set the bar! Thanks a ton! Wow what a great idea! I saw this featured on Alicia Paulson’s blog, Posie Gets Cozy. I was inspired by your brilliant idea so I put up a few in my kitchen. Thanks for sharing! You’re a genious! Fabulous idea! Unfortunately, that fabric was a seasonal print by Liberty and is now completely gone… We loved it too! Wow, I am in love with this idea, finally a way to enjoy the fabric just for the fabric you know. I’ve been wanting to do this for a while but haven’t found a good stash of reasonably priced embroidery hoops yet. Then to decide what fabrics to put in them! Just love this idea and love your blog. I get so much inspiration by visiting. Keep up the good work!! This wall is gorgeous. I'm going to do a small wall with embroidery hoops going up my stairs. Thanks!! I just found this site and am so glad I did. 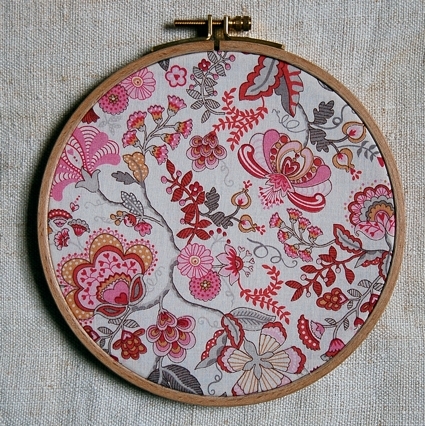 I love the idea of putting fabrics in my embroidery hoops of which I have several in many sizes. 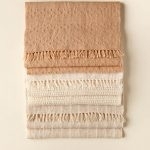 Love the fabrics on this site also. A little pricey for me but maybe someday I can afford to buy a little bit anyway. I'd like to have something little different than usual. I'll be back often to look into what all is on this site. I love sewing and hand work. Must have been meant to be for me to find this site, so glad I did. Gasp (puts head between knees to recover from such a beautiful thing). I love Liberty of London so much. 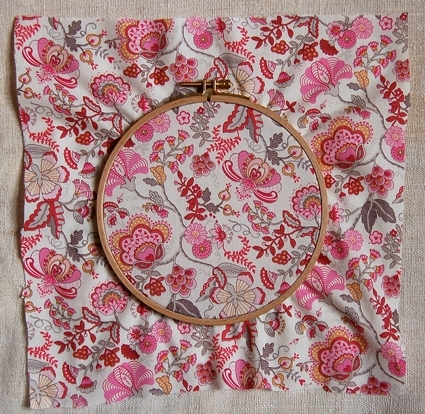 I can see this being so pretty on a sewing room wall…what about using a bunch of pretty vintage fabric for this? Sure. This works with any woven fabric. This is a great idea. I have been searching the Liberty of London sites on Google for the print that has the birds in it, red with yellow flowers. Do you happen to know what the print # or name is? Thanks for writing in! Sadly the print that you are referring to was a seasonal print from 2007, meaning that they only produced it that year. The name of the print was Birdsong but I am not sure what the color was. I hope that this was helpful and happy hunting!